As we continue to search out the whole world for the best values in Western boots, Cultured Cowboy will keep adding pages! 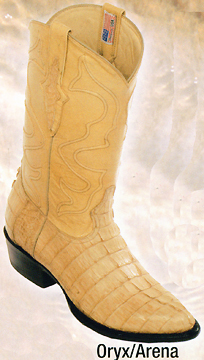 Wild West Boot Company is sort of formed from an older boot maker, Los Altos Boots. 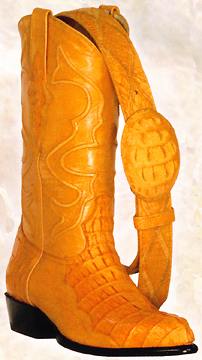 Looking at their quality, it is a very nice traditional exotic boot for the money. 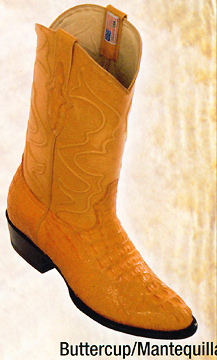 Exotics are their specialty, and with the difficulties of other makers providing Caiman Alligator boots fast enough for our customers, we were tickled to find these guys. To get these really good prices, we had to commit to some volume in certain sizes. 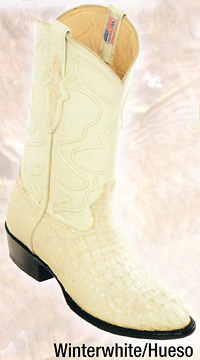 For this page, 600 series R toe boots are D widths in stock. EE in R toes will take 6 to 8 weeks. And, 992 series come EE in stock, with D widths taking 6 to 8 weeks. 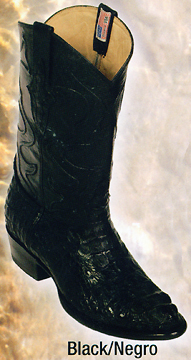 Caiman is a smaller alligator, much easier to work with as a leather, than the more labor intensive American alligator that costs $1400.00 & up. 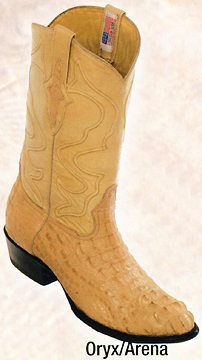 This caiman alligator boot has a lot of textured detail without huge "wings" at the toe. Classy. Take a look at the detailed raised stitch design on the shaft. Nice. The pattern makes the shaft stay new looking longer, yet flexes easily for your comfort. Fanciful pull tabs. Each color has these beneficial specifications: Leather outsole on an all leather upper. Glove lining. Med Round (R) toe. Slightly underslung walking heel. Handcrafted. Buttercup color. Leather outsole on an all leather upper. Glove lining. Med Round (R) toe. Slightly underslung walking heel. Handcrafted. Cognac color. 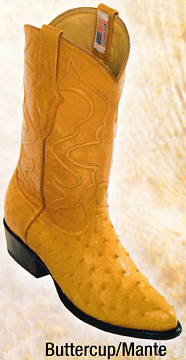 (Sometimes called Peanut Brittle) Leather outsole on an all leather upper. Glove lining. Med Round (R) toe. Slightly underslung walking heel. Handcrafted. Winter White color. Leather outsole on an all leather upper. Glove lining. Med Round (R) toe. Slightly underslung walking heel. Handcrafted. Black color. 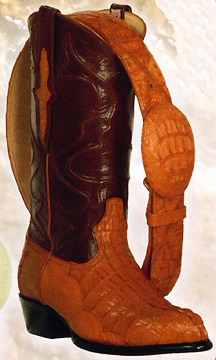 Leather outsole on an all leather upper. Glove lining. Med Round (R) toe. Slightly underslung walking heel. Handcrafted. Oryx color. Leather outsole on an all leather upper. Glove lining. Med Round (R) toe. Slightly underslung walking heel. Handcrafted. Caiman is a smaller alligator, much easier to work with as a leather, than the more labor intensive American alligator that costs $1400.00 & up. 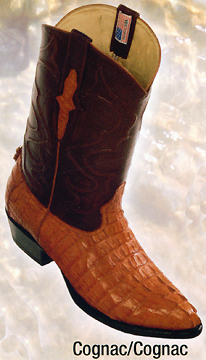 This caiman alligator boot, also known as hornback alligator, has a lot of textured detail. 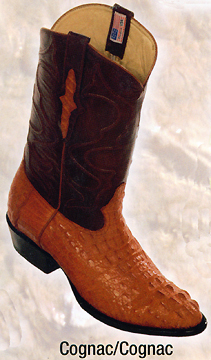 Caiman head alligator boots use the upper body of the caiman. 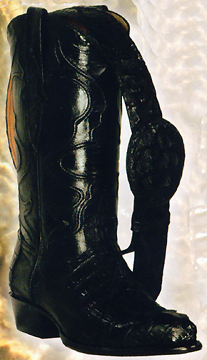 Again, moderate knobby details. Classy. Take a look at the detailed raised stitch design on the shaft. Nice. The pattern makes the shaft stay new looking longer, yet flexes easily for your comfort. ach color has these specifications: Leather outsole on an all leather upper. Glove lining. Med Round (R) toe. Slightly underslung walking heel. Handcrafted. 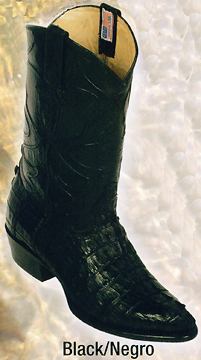 This Caiman Alligator Head boot is appropriate, (especially in black), for even the more formal occasions. With jeans, it is dressed down enough to work as a higher value, tough looking, (says - I am my own man.) 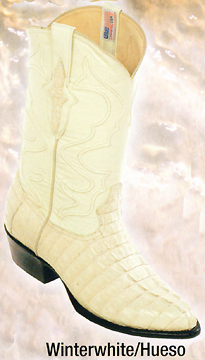 comfy boot. Cognac (Peanut Brittle) color. 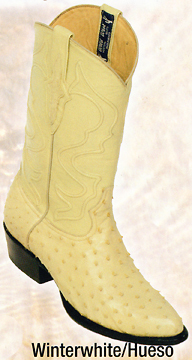 Leather outsole on an all leather upper. Glove lining. Med Round (R) toe. Slightly underslung walking heel. Handcrafted. Cognac color. Leather outsole on an all leather upper. Glove lining. Med Round (R) toe. Slightly underslung walking heel. Handcrafted. Buttercup color. 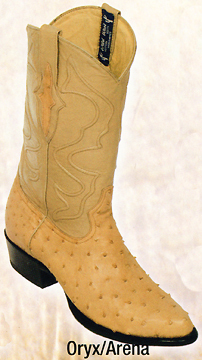 Leather outsole on an all leather upper. Glove lining. Narrow Round (J) toe. Slightly underslung walking heel. Handcrafted. Cognac color. 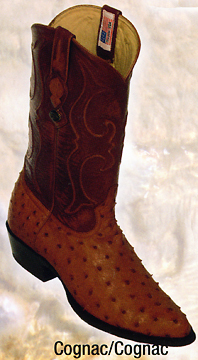 Leather outsole on an all leather upper. Glove lining. Narrow Round (J) toe. Slightly underslung walking heel. Handcrafted. Winter White color. 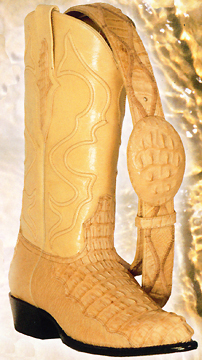 Leather outsole on an all leather upper. Glove lining. Narrow Round (J) toe. Slightly underslung walking heel. Handcrafted. Black color. Leather outsole on an all leather upper. Glove lining. Narrow Round (J) toe. Slightly underslung walking heel. Handcrafted. Oryx color. Leather outsole on an all leather upper. 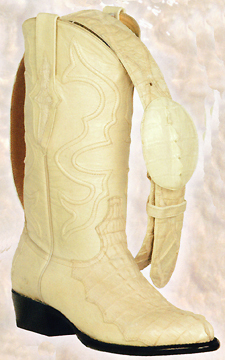 Glove lining. Narrow Round (J) toe. Slightly underslung walking heel. Handcrafted.